Mortgage lenders are scrapping exit charges, levied when a home loan is paid off, following pressure from the Financial Services Authority (FSA). HBOS, which includes the Halifax, has become the latest lender to scrap mortgage exit fees. Earlier this year, the FSA said that lenders had raised mortgage exit fees too rapidly and some customers could be in line for a refund. But lenders are simultaneously raising mortgage set-up fees, researchers say. The level of mortgage exit fees had shot up in the last four years, from an average of less than £100 to about £200. 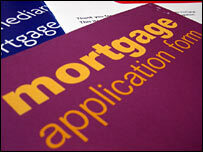 In the most extreme cases, lenders were charging customers £300 to wind up their mortgage. Following complaints from consumer groups, the FSA investigated exit fees. It found that raising the fees might be unfair, especially if there was nothing mentioned in the mortgage deal giving the lender the power to do so. As a result, people who had paid the raised charges were able to go back to their former lenders and ask for some of their money back. In response to the FSA findings, lenders have acted to cut or abolish their exit fees. Cheltenham & Gloucester, Standard Life, Royal Bank of Scotland and Northern Rock have all scrapped their fees. Likewise, on Tuesday, HBOS got rid of its exit fee altogether. But financial information group Moneyfacts warned that lenders could be making up the shortfall through arrangement fees, levied when a mortgage is set up. "If you going to cut off one stream of income - in this case exit fees - it is logical that some lenders will look to raise money elsewhere," Andrew Hagger, Moneyfacts spokesman, said. In the past month, 10 major mortgage lenders, including NatWest, Lloyds TSB and the Woolwich, have increased their mortgage arrangement fees. Some lenders had put up their arrangement fees by as much as £1,000, Mr Hagger added.